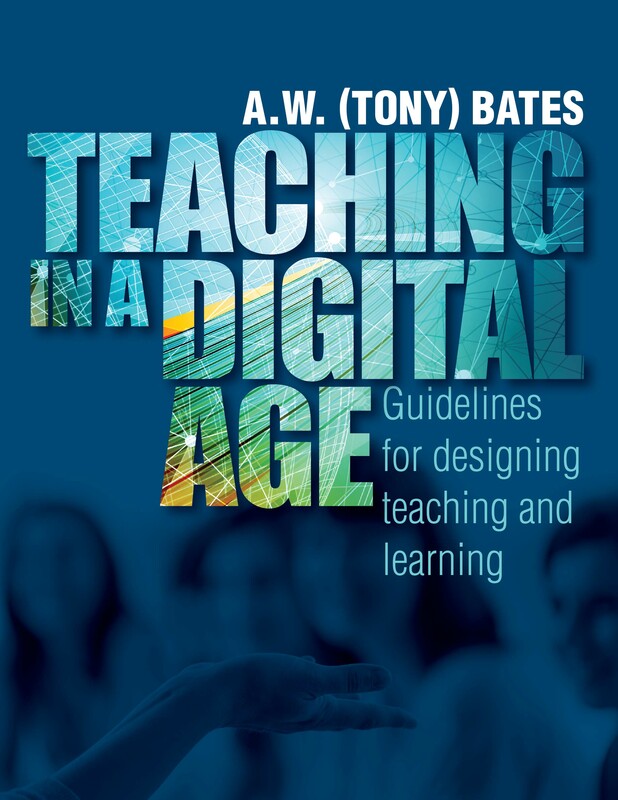 The book "Teaching in a Digital Age" by A.W. (Tony) Bates (2016, 528 pages) is an excellent free resource available on-line from the Canadian B.C. Open Textbook Project. This book is intended for college and university instructors who want to know how digital technology can help them teach. The book is available a variety of electronic formats and three languages (English, French, and Vietnamese). Print editions of the book can be purchased, with a black and white edition at half the price of color (an option I have never seen before). At 22 Mbytes, the PDF version is a bit large to expect a student to download just to read one chapter. However, the web version is divided into short sections and so would be useful for referencing as reading material in a course. It would be useful to have a PDF and EPUB edition which leaves out most of the images, which are only decorative but take up a lot of file space. Each chapter is accompanied by a three-minute audio introduction by the author. This audio adds a useful personal touch and is not too long. There is also a "Scenario" at the start of each chapter, setting out a hypothetical situation. However, these are only briefly referred to in the text of the chapters. In particular, I was disappointed that the scenarios were not used as part of the discussion questions contained in the chapters. The first chapter (Fundamental Change in Education), looks at how universities and students are changing. There is perhaps a little too much of the author's views on the nature of education than is strictly necessary, but such a distinguished author can be allowed a little latitude. It is important to realize that this is not just a book about online learning, but about teaching in general and where on-line learning fits in. Chapter 2 provides a reasonably conventional introduction to theories of learning. This is a part of teaching courses where my eyes (and I suspect of other students) glaze over. As noted in Chapter 3 (Methods of teaching), real world teaching does not fit neatly into these categories, and I suggest it might be better to reverse the usual order and first teach students the how and provide the theory of why later (moving this section to later in the book). The book reflects the author's background in the UK and Canada. There is extensive use of reports from the OECD. This comes as a relief for someone like myself, a student of education who as had to read many works from US authors who do not seem to realize that the rest of the world exists. While the book has extensive references and a bibliography, it does not have a reading list (which would be a useful addition to a course). A bigger the problem is that the book spends a little too much time arguing the case for digital learning (and in the case of MOOCs, arguing against them). A better approach, I suggest, would be to simply cover the different educational techniques, pointing out where and when they should be used, and why. There is a danger in e-learning being seen as something new which a case has to be made for when it has been around for deaconess and is proven in day-to-day use. The different techniques should be covered in proportion to how important the author thinks they are. As an example, I suggest that the order should be reversed, so that on-line teaching is covered first and lectures later. Chapter 5 (MOOCs), spends a little too long on a case for or against MOOCs. In my view, MOOCs are not a new form of on-line education, just a way to promote conventional distance education. The MOOC label makes DE more palatable to prestigious research universities, which do not want to admit adopting educational techniques developed by teaching orientated institutions. Universities and others also use "Free" MOOCs to promote their for-fee programs. Chapter 7 (Pedagogical differences between media), makes the important point that text still has a major role in education and that audio is useful. Something I find surprising is that most teachers (and students) think of recorded lectures and live webinars as being "video," when the mostly consist of audio with still images of text and graphics. Chapter 8 (Choosing and using media in education) is largely redundant. Higher Education students today typically have a smartphone and a laptop computer, or tablet, or access to some other larger screen device. They have low-speed broadband Internet access. So the course designer should design for these tools. Some institutions (and educational systems) have wasted resources on equipping students with specialized hardware. In other cases, teachers refuse to make use of the IT the students have, for fear this will distract them from studying using paper books. In Chapter 9 (Modes of delivery) presents evidence that on-line learning is at least as good as face-to-face. This case needs to be put. However, the chapter perpetuates the myth that on-campus learning depends on the direct face-to-face interaction between students and teachers. Most interaction on campus between students and teachers is mediated by technology. A student, at least an undergraduate or coursework graduate student, will rarely speak face to face with a professor. The student does not hear the professor's voice directly in a lecture theater; it is instead conveyed via a digital audio system. This is increasingly also the case in the labs replacing conventional lectures and tutorials. In traditional labs and tutorials, the student would be able to see and hear the instructor directly. However, the X-lab at the University of Sydney has up to 240 students at work benches, under the direction of one instructor. Each student is provided with a video screen so they can see the instructor, who can't easily be seen directly, due to the equipment in the lab. To make this point clearer, as a thought experiment, imagine the instructor being in another room, on the other side of the world: would the students notice? Would this make any difference to the quality of the education? The book "Teaching in a Digital Age" is a very useful resource, but could do with some editing down and rearrange. As the book is provided with a Creative Commons license, I might try remixing it. ps: I confess a fondness for Canadian educational work, having recently completed a Masters of Education at Athabasca University. Found this quite useful and very userfriendly ! For those teaching in Online space.